The job description of a registered nurse is larger in scope than a vocational or practical nurse, so the NCLEX-RN will have questions relating to topics that do not appear on the NCLEX-PN, such as management of parenteral nutrition and administration of blood products. Otherwise, many questions appear identically on both exams. The distribution of like categories and subcategories is significantly different on both exams, to reflect the differences in job descriptions between RNs and PNs. Category and subcategory distribution is found at the bottom of each test description. The NCLEX-PN exam is required for those who intend to be licensed as a vocational or practical nurse. While quite similar, this exam has a bit smaller scope than the NCLEX-RN. 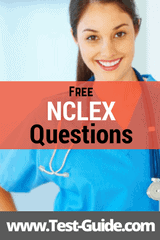 It is important to use the appropriate NCLEX questions for whichever NCLEX test and subtest you are taking. The NCLEX-RN exam is required for those who intend to be licensed as a registered nurse. While quite similar, this exam has a larger scope than the NCLEX-PN. In order to register for the NCLEX, the candidate must first request a license/registration application from the BON/RB. Application materials and licensing fees must be submitted to the BON/RB. The candidate may then register to take the NCLEX through Pearson Vue. Eligibility requirements will vary because each BON/RB has it’s own requirements for eligibility. Contact your BON/RB to confirm your eligibility requirements. Be sure that you are enrolled in the correct exam (RN/PN) and have taken the appropriate NCLEX questions. The NCLEX is a pass or fail exam. Although the score is calculated as you continue through the test, results will not be made immediately available. Exam results are forwarded to your BON/RB, and will be forwarded to the candidate approximately six weeks after completion of the exam. The National Council Licensure Examination is an important step to obtaining your nursing license and beginning your career. To register for your NCLEX and begin on your NCLEX questions, please visit https://www.ncsbn.org/nclex-application-and-registration.htm.